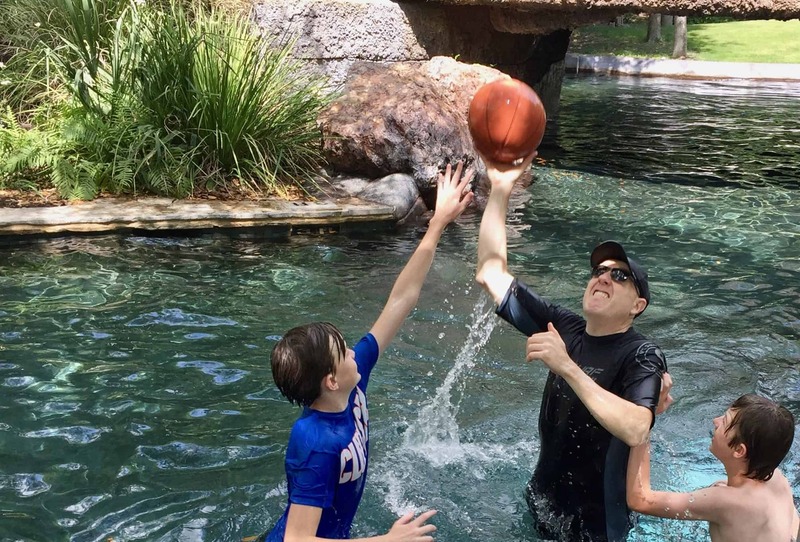 Now that my boys are teenagers, I’ve become an even bigger fan of vacationing at resorts that offer non-stop activities for all ages. We’re no longer in the “24/7 togetherness” phase of childhood, thank goodness, and that’s a wonderful thing because now we can do some things together, some things alone, and then all relax in our own way. (My way = rocking chair, book and a glass of wine. I’m okay being a mom cliche.) 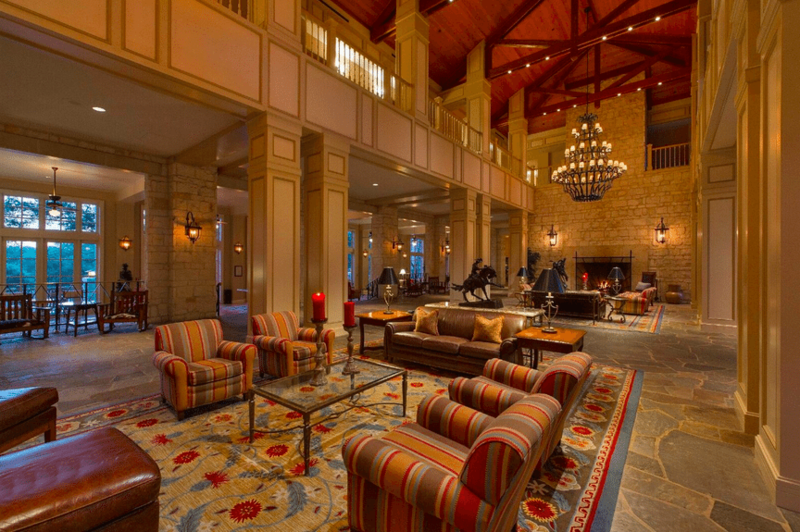 And there’s no better place to for a trip like this than the Hyatt Regency Hill Country Resort in San Antonio, Texas. 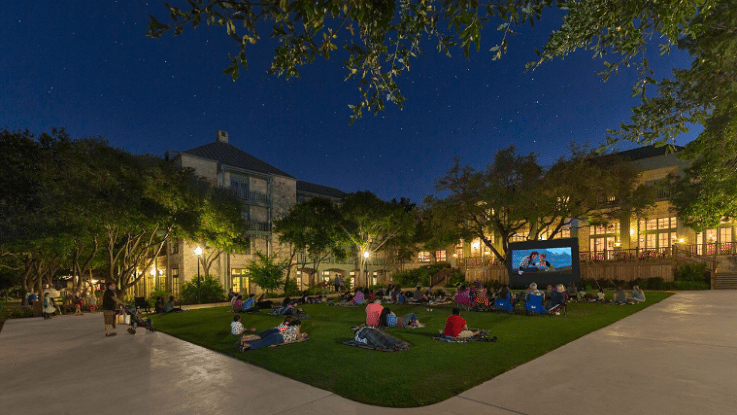 The Hill Country Hyatt is just a 60-minute drive from our house in Austin, and it’s also a quick trip from the San Antonio airport (16 miles), making it an easy destination for those coming from out of town. The property was built upon 300 rolling acres of a historic Texas family ranch, and it really gives you the “wide open spaces” feel with its peaceful and natural setting. There are 500 guest rooms and suites at the Hyatt, all nicely appointed. The four of us were able to stay in adjoining rooms and trust me, that’s a game-changer when you have two tall boys who aren’t super thrilled to be sharing a bed. We also felt comfortable with them coming and going as long as they had their room keys and cellphones because the resort is pretty contained. If you have smaller kids, I’d strongly suggest requesting a first floor room that gives you easy access to the hotel grounds without needing to walk far. Now, onto the Hill Country Hyatt activities, and there are many. First up, water fun. 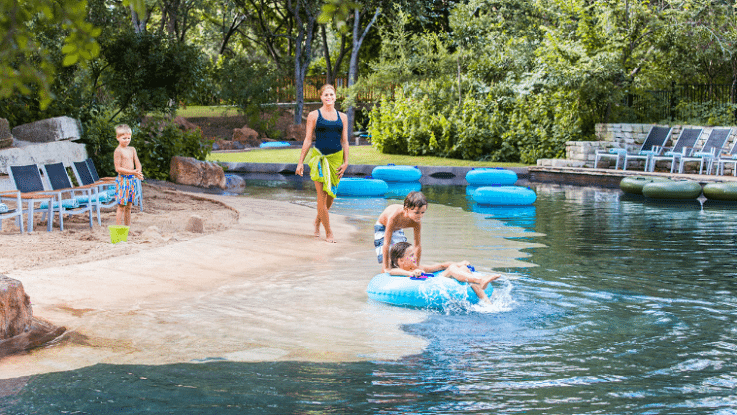 There are 5-acres of water parks and pools at the Hyatt, including a Texas-shaped pool, an adults-only outdoor pool at the Wildflower spa, and a zero-entry wading pool for the little ones. You can rent a stocked private cabana with a TV and amenities, but there are also plenty of available chaise loungers, many in the shade. My kids loved floating along the pretty 950-foot Ramblin’ River in tubes, and they also spent a lot of time playing basketball with their dad in the sizable activity pool. 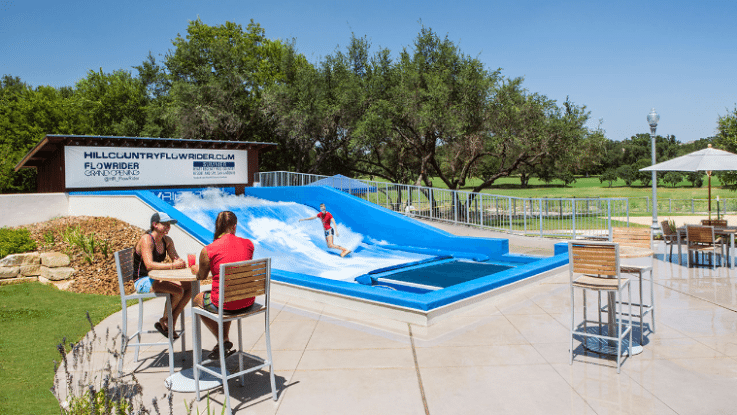 The Hyatt also has a 22-foot water slide (must be 42″ to ride), and for real thrill-seekers, there’s the FlowRider®, the exciting attraction that simulates a “barrel-less” wave for body, knee and stand-up boarders. We weren’t quite brave enough to try the FlowRider, but we definitely enjoyed watching others wipe out while we ate lunch at Papa Ed’s Pool Bar. Great entertainment. Other activities at the Hyatt include a playscape, sand volleyball, tennis, a health club, jogging, nature, and bike trails (complimentary bikes and helmets available) and daily kid’s activities for all ages. Check their website for specifics. 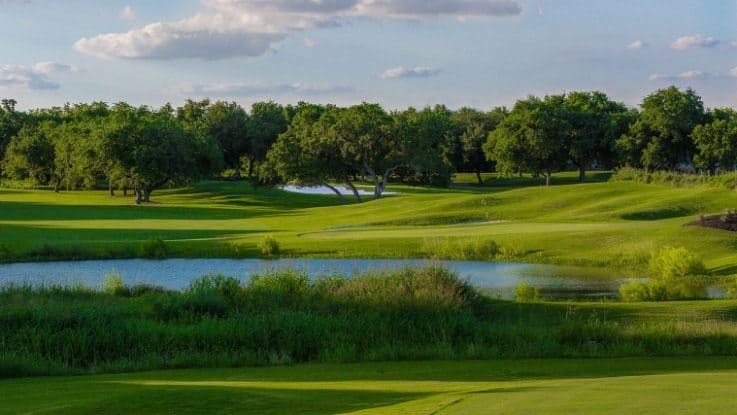 But by far our favorite activity at the resort was the very reasonably priced Family Express Golf on the resort’s 27 hole championship Hill Country Golf Club. The thought behind Family Express Golf is to encourage beginners, and nurture families with children to learn the game of golf in a relaxed atmosphere. We played nine holes with “express tees” that had shortened distances, pars and handicaps. We all really loved this activity (the boys especially enjoyed driving the golf carts) to the extent that we’re all now planning on taking golf lessons. Fore! 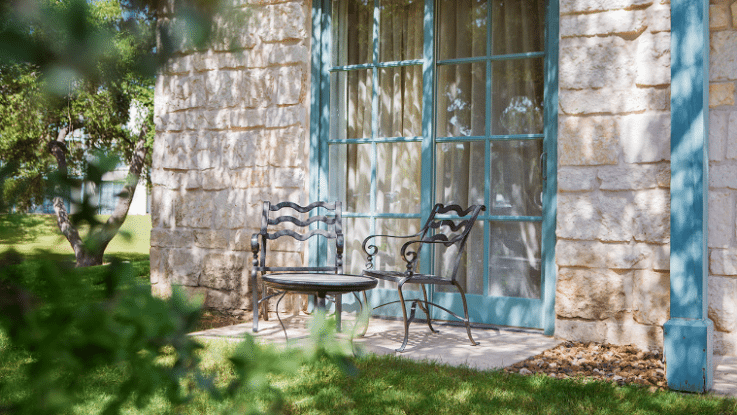 Now onto my second favorite part of the resort: Windflower – The Hill Country Spa. 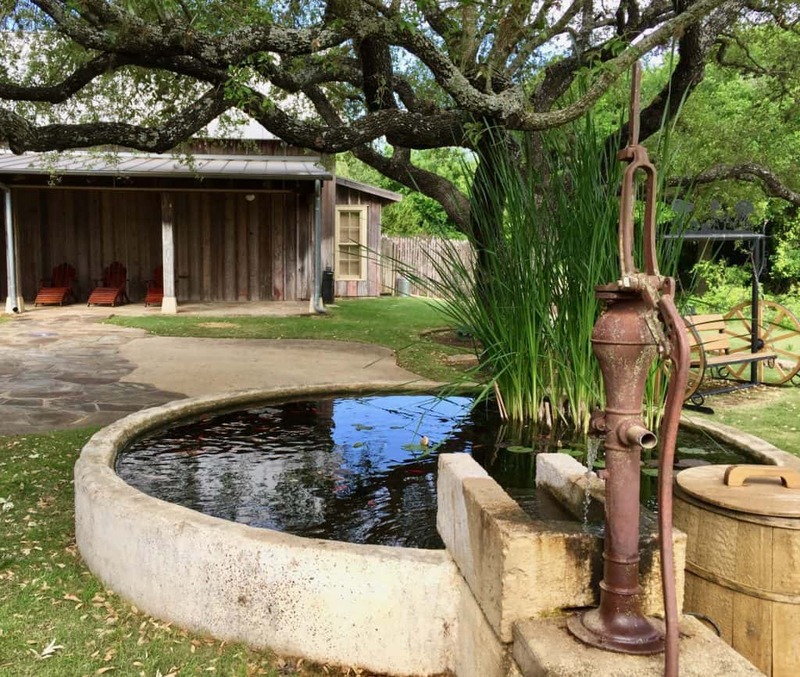 After waking up early and going to the complimentary outdoor yoga with a view, I spent some time at this 19th century Texas Hill Country homestead style spa that’s incredibly relaxing. They offer the usual spa treatments in their 21 treatment rooms, and I have to say that my 50-minute massage was one of the best I’ve ever received. You don’t have to be a hotel guest to take advantage of the spa, either. As for dining, Hill Country Hyatt has many options. On the upscale side, there’s Antlers, next to the golf club, and for more casual family fare, there’s the Springhouse Cafe (excellent Sunday brunch buffet), Papa Ed’s Pool Bar and Grill, and the General Store for coffee, sandwiches and pretty great breakfast tacos. We also spent a lot of time at Charlie’s Long Bar where they only serve drinks and snacks, but where the boys were able to play pool, darts and shuffleboard like the Texas hustlers they aspire to be. 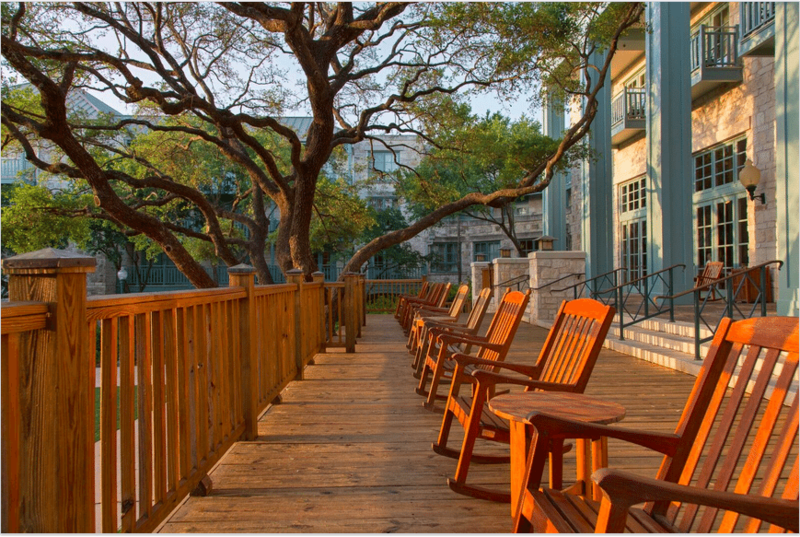 Hill Country Hyatt has plenty to keep you busy for a few days, making it the ideal weekend getaway for families throughout Texas. 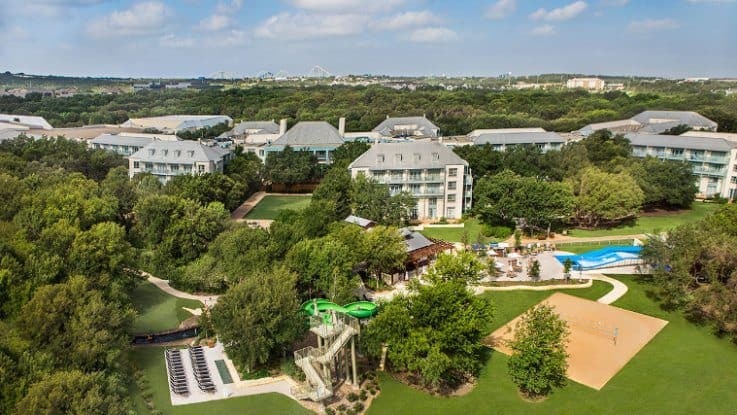 However, consider staying even longer because in addition to the resort activities, the Hyatt is conveniently located next door to Sea World San Antonio. Like right next door. It’s also not far from Six Flags Fiesta Texas, as well San Antonio’s famous River Walk and the (never forget) Alamo, so you’ll have no shortage of things to do. But if you just want to sit on the porch and rock, that’s okay, too. Thank you to Hyatt Regency Hill Country Resort and Spa for hosting my family for a weekend. We had a wonderful time and can’t wait to come back. All opinions, experiences are mine. All photos via Hyatt except where noted.